Dancer, choreographer, musician, writer…storyteller. Whether she is using the medium of dance, rhythm or words Joie seeks to bring to life the character present in a creative work. A lifelong dancer Joie entered the world of belly dance through the side door of raqs gothique (gothic belly dance) after falling in love with its dramatic storytelling nature. She went on to study the more traditional cabaret and Turkish styles of the dance which only made her fall more deeply in love with the art form. Joie is a practitioner and teacher of Contemplative Dance & Authentic Movement. She untilizes techniques from this practice to teach embodiment to dancers and other movement artists. She works with students in classes and one on one to help them connect to and express their creative voice. She has completed the Contemplative Dance Year Long Program (Year 1) with Daphne Lowell and Alton Wasson. She is the founder and director of the interdisciplinary variety show performance troupe Dark Follies which formed in 2008. 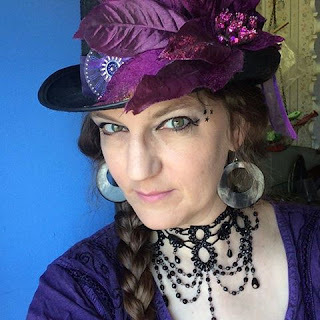 She teaches and performs around New England with Dark Follies and as a solo artist. You may support her work by becoming a Patron at Patreon.